Background: Gaillardia grandiflora Hort. ex Van Houte and Gaillardia pulchella Foug are flowering plants widely cultivated in Egypt for their ornamental value. Previous reports demonstrated that sesquiterpene derivatives represent the major compounds in both species. Moreover, only few flavones were identified from genus Gaillardia and few studies on the cytotoxicity of G. pulchella were found. Aim of the Study: Investigation of the phenolic constituents of the aerial parts of both species and evaluation of their anti-inflammatory and hepatoprotective activities. Materials and Methods: The 80% aqueous methanol extracts (AME) were prepared for both plants and evaluated for their biological activities. Phytochemical investigation of both extracts resulted in isolation of twelve compounds, which have been identified on the basis of ultraviolet, 1D and 2D nuclear magnetic resonance spectroscopy and negative ESI-MS. Results: The new 8-hydroxyapigenin 6-O-β-D-apiofuranosyl-(1'''→6'')-C-β-D-4C1-glucopyranoside was isolated from G. grandiflora for the first time in nature, along with schaftoside, luteolin 6-C-β-D-4C1-glucopyranoside 8-methyl ether, apigenin 6-C-β-D-4C1-glucopyranoside 8-methyl ether, isoorientin, isovitexin, 6-methoxyluteolin and hispidulin, as well as vicenin-2, vitexin, luteolin and apigenin, which were isolated from G. pulchella together with 6-methoxyluteolin. Furthermore, the AME of both species were found to be nontoxic to mice and exhibited significant anti-inflammatory and hepatoprotective activities in dose dependent manner. Conclusion: Current results shed light on the phenolic constituents of G. grandiflora and G. pulchella aerial parts and the safety of the AME of both species, in addition to their significant anti-inflammatory and hepatoprotective activities. Both plant species may be promising candidates for natural anti-inflammatory and hepatoprotective drugs. Abbreviations used: ALP: Alkaline phosphatase; ALT: Alanine aminotransferase; AME: The 80% aqueous methanol extract of G. grandiflora or G. pulchella aerial parts; AST: Aspartate aminotransferase; br d: Broad doublet; Comp-PC: Comparative paper chromatography; d: Doublet; 2D-PC: Two-dimensional paper chromatography; DMSO-d6: Deuterated dimethyl sulfoxide; G.: Gaillardia; GPx: Glutathione peroxidase; GRd: Glutathione reductase; GSH: glutathione; GST: Glutathione-S-transferase; J: Nuclear spin-spin coupling constant; m: Multiplet; [M-H]. : Molecular ion peak; MDA: Malondialdehyde; m/z: Mass/charge ratio; NO: Nitric oxide; p: Probability; PC: Paper chromatography; Rf: Retention flow; rpm: Rotation per minute; s: Singlet; SDE: The ethanol extract of Scoparia dulcis; SE: Standard error; SOD: Superoxide dismutase; TMS: Tetramethylsilane; γmax: Maximum fluorescence emission wavelength. Gaillardia grandiflora Hort.exVan Houte and Gaillardia pulchella Foug(Asteraceae)are commonly known as firewheel, Indian blanket, Indian blanket flower, or sundance. They are short-lived flowering plants native to the Central United States  and are widely cultivated in Egypt for their ornamental value. Genus Gaillardia includes about 23 species, but only three of which are commonly known, these include G. pulchella, which is an annual plant, while G. grandiflora and G. aristata are perennial plants. Previous reports demonstrated that sesquiterpene derivatives represent the major compounds isolated from G. pulchella,, as well as few of which are identified from G. grandiflora., Moreover, only few flavones were identified from genus Gaillardia, and only few reports about the cytotoxicity of G. pulchella, were found. This was encouraging to investigate the phenolic constituents of both species and to evaluate the anti-inflammatory and hepatoprotective activities of the aqueous methanol extract (AME) of G. grandiflora and G. pulchella aerial parts. The study resulted in isolation and structure characterization of several flavones from both extracts for the first time, supported by ultraviolet (UV),1H and 13 C nuclear magnetic resonance (NMR) and ESI-MS spectrometry. G. grandiflora Hort.exVan Houte and G. pulchella Foug aerial parts were collected during the flowering stage from El Azhar Park, Cairo, Egypt (March 2006 and April 2007). Authentication of the plant was performed by Terase Labib, Senior Specialist of Plant Taxonomy and former Head of El Orman Botanical Garden, Giza, Egypt. Voucher specimens (No. G.G.1, G.P.1) have been deposited at the Pharmacognosy Department, Faculty of Pharmacy, Helwan University, Cairo, Egypt. The NMR spectra were run at 300 and 500 (1H), 75 and 125 (13 C) MHz, on Varian Mercury 300 and JEOL GX-500 NMR spectrometers, respectively. The chemical shifts (δ) are reported in ppm downfield to TMS in the appropriate deuterated solvent. For ESI-MS analyses, LCQ (Finnigan MAT 95, Bremen, Germany) and LTQ-FT-MS spectrometers were used, while HR-ESI-MS (Thermo Electron, Finnigan, Germany) was used for HR-ESI-MS analyses. UV spectrophotometer (JASCO V-630) was used for analysis of pure samples in MeOH and in different UV shift reagents. Material for column chromatography (CC), including microcrystalline cellulose, polyamide S 6 and Sephadex LH-20, as well as Whatman No. 1 sheets used for paper chromatography were purchased from sources described in our previous literature. Isolated compounds were detected using Naturstoff  and/or FeCl3 (1% in ethanol) spray reagents. Solvent systems S1(n-BuOH/HOAc/H2O; 4:1:5 v/v/v top layer), S2(HOAc/H2O; 15:85 v/v) and S3(n-BuOH/iso- propanol/H2O; 4:1:5, v/v/v top layer) were used. Indomethacin was obtained from Epico, Egypt; paracetamol and silymarin from Sedico, 6th October, Egypt; carrageenan from Sigma, USA; alanine aminotransferase (ALT), alkaline phosphatase (ALP) and aspartate aminotransferase (AST) kits were purchased from Marcy' Étoile (France). The powders of G. grandiflora (1150 g) and G. pulchella (950 g) air-dried aerial parts were individually exhaustively extracted with 80% aqueous methanol under reflux (5 L × 5, 60°C, 4 h). The solvent was evaporated under reduced pressure and the residue (180 and 150 g in case of G. grandiflora and G. pulchella, respectively) was refluxed with CHCl3 (1.5 L × 3, 60°C, 1h). The dried CHCl3 extract and residue were 32 and 140 g in case of G. grandiflora, and 23 and 115 g from G. pulchella. The residue in each case was precipitated from H2O using excess methanol (1:10). This was followed by evaporation of the filtrate under vacuum to afford 105 and 90 g of residue in case of G. grandiflora and G. pulchella, respectively. The dried extract in each case was subjected to CC using polyamide (300 g, 1.1 m × 50 mm) and H2O-MeOH mixtures (100:0–0:100%) to afford 35 fractions (1 L each), which were collected into six collective fractions (A-F) in case of G. grandiflora. Similar chromatographic procedure afforded 30 fractions, each of 1 L which were collected into five collective fractions (A-E) in case of G. pulchella. The collection of the fractions was done by the aid of comparative paper chromatography (comp-PC), UV-light and spray reagents. In case of G. grandiflora, fraction A (3.15 g) was devoid of polyphenolic compounds, as investigated in our previous study. Fraction B (550 mg) was subjected to CC using Sephadex LH-20 and H2O/MeOH mixtures as eluents (10–90%). This yielded two sub-fractions (i and ii), each containing one major compound. Final purification of both sub-fractions was done on cellulose column (50% MeOH/H2O) to give pure samples of 1 (20 mg) and 2 (17 mg). Fraction C (410 mg) was subjected to successive cellulose columns using 10-90 % aqueous MeOH, to afford pure 3 (16 mg) and 4 (21 mg). The pure compound 5(17 mg) was obtained by applying fraction D (210 mg) to a Sephadex LH-20 column, using MeOH/H2O mixtures (50–100%). Fraction E (120 mg) was purified by successive cellulose columns using aqueous MeOH mixtures (10–60%) for elution, to afford pure 6 (23 mg). Fraction F (950 mg) was subjected to cellulose CC using 10–90% aqueous MeOH as eluent, which afforded two main sub-fractions. Each of them was individually purified on Sephadex LH-20 column using 50% aqueous MeOH and 100% methanol as eluents, to give pure 7 (19 mg) and 8 (21 mg). Moreover, in case of G. pulchella fraction A (4.50 g) was devoid of polyphenolic compounds, as investigated in our previous study. Fraction B (550 mg) was subjected to Sephadex LH-20 CC using H2O/MeOH mixtures (10–90%) as eluent, to afford pure 9 (25 mg). Fraction C (350 mg) was applied on a cellulose column using S3 for elution and finally purified on Sephadex LH-20 column using MeOH, to give pure sample of 10 (20 mg). Fraction D (150 mg) was purified by successive cellulose columns using aqueous MeOH mixtures (10–90%) for elution, to afford pure 7 (17 mg). Two main sub-fractions (i and ii) were obtained upon purification of fraction E (300 mg) using cellulose column and MeOH/H2O (50%) for elution. Both sub-fractions were individually applied to a Sephadex LH-20 column using S3 for elution, to give pure samples of 11 (21 mg) and 12 (19 mg). The homogeneity of all fractions was tested using 2D- and comp-PC, and solvent systems S1 and S2. Yellow amorphous powder: Rf-values: 0.15 (S1), 0.45 (S2) on PC; it gave a dark purple spot under UV-light, which turned to yellowish green fluorescence on exposure to ammonia vapor and Naturstoff spray reagents, as well as green color with FeCl3. UV δmax nm: (MeOH): 272, 340; (+NaOMe): 283, 341, 401; (+NaOAc): 282, 300, 393; (+NaOAc/H3 BO3): 272, 328, 352; (+AlCl3): 283, 304, 352, 394; (+AlCl3/HCl): 281, 304, 350, 395. ESI/MS m/z 579.1 [M-H]-, 284.3 [aglycone -H]−.1H NMR (DMSO-d6, 300 MHz): δ ppm 8.13 (2H, d, J = 8.4 Hz, H-2'/6'), 6.92 (2H, d, J = 8.4 Hz, H-3'/5'), 6.79 (1H, s, H-3), 5.19 (1H, d, J = 1.2 Hz, H-1'''), 4.66 (1H, d, J = 9.0 Hz, H-1''), 3.88 (1H, br d, J = 10.5 Hz, H-6a''), 3.74 (1H, t-like, J = 6.9 Hz, H-2''), 3.49 (1H, br d, J = 12.5 Hz, H-6b''), 3.17 (2H, m, H-3”/4'').13 C NMR (DMSO-d6, 125 MHz): δ ppm 182.27 (C-4), 163.77 (C-2), 161.25 (C-4'/7), 158.26 (C-5), 155.15 (C-9), 128.83 (C- 2'/6'), 128.58 (C-8), 121.29 (C-1'), 116.12 (C-3'/5'), 109.03 (C-1'''), 108.81 (C-6), 102.51 (C-3/10), 82.57 (C-5''), 79.62 (C-3''), 79.48 (C-3'''), 76.49 (C-2'''), 74.17 (C-4'''), 73.86 (C-1”), 70.44 (C-2''), 70.35 (C-4''), 69.25 (C-6''), 64.71 (C-5'''). Sprague-Dawley albino rats of both sexes (125–150 g) and Swiss mice (20–30 g) were obtained from the National Research Centre (Animal House), Dokki, Giza, Egypt. The animals were accommodated in standard metal cages at 22°C ± 3°C, 55% ± 5% humidity and were supplied with standard laboratory diet and water ad libitum. All animal procedures were carried out in accordance with the Ethics Committee of the National Research Centre (Egypt, April 2009). In addition, they followed the recommendations of the National Institutes of Health Guide for Care and Use of Laboratory Animals. The AME extracts of G. grandiflora and G. pulchella were individually dissolved in distilled water and given orally to mice in graded doses up to 5 g/kg b. wt., while the control group obtained the same volume of distilled water. The percentage mortality was registered 24 h later, and none was observed for both extracts. According to Semler  the determination of LD50 in this case is no longer required. The doses of the extract used in this study were 500 and 1000 mg/kg (1/10 and 1/5 of the highest nontoxic tested dose, respectively). Paw swelling was induced by sub-plantar injection of carrageenan suspension into the right hind paw (100 μl of 1% in saline). The edema was quantified by measuring hind footpad with a micrometer caliber, before and 1-4 h after carrageenan injection. The results were expressed as percentage of change from control values. Rats were divided into six groups, each of six. The control group received orally 0.02 ml saline, the 2nd–5th groups were orally given 500 and 1000 mg/kg of AME of G. grandiflora and G. pulchella. The 6th group was orally given indomethacin (25 mg/kg b.wt., in Na2 CO3 5%). The extracts and indomethacin were given 60 min before the injection of the carrageenan suspension. Hepatotoxicity was induced using paracetamol orally at a dose of 1000 mg/kg in H2O. Rats were divided into seven groups, each of six. The control group received orally 1 ml saline/day, while the 2nd group received paracetamol. The 3rd–6th groups received orally 500 and 1000 mg/kg of AME of G. pulchella or G. grandiflora, while the last group received silymarin as reference drug (orally, 25 mg/kg). Both AME extracts and silymarin were given for 7 days before paracetamol injection. After 24 h of paracetamol injection, the blood samples were obtained by puncturing rato-orbital plexus. After centrifugation at 2500 rpm, the serum was used for determination of ALT, AST  and serum ALP. The results are presented as mean ± standard error. All the data were statistically evaluated using Student's t-test and one-way ANOVA. The *P<0.05 were considered significant. 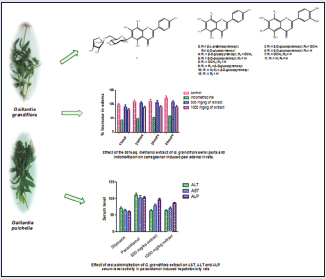 The 2D-PC screening of the G. grandiflora and G. pulchella aerial parts disclosed the presence of a mixture of flavone aglycones and glycosides (color properties under UV-light and responses to ammonia, FeCl3 and Naturstoff spray reagents). Both mixtures were individually fractionated on a polyamide column, followed by successive cellulose and/or Sephadex LH-20 columns to afford the pure compounds 1-12. Compound 1 was isolated from G. grandiflora and nature for the first time, together with compounds 2-8, while compounds 9-12 and 7 were isolated from G. pulchella. All compounds, except 10 were isolated from genus Gaillardia for the first time. 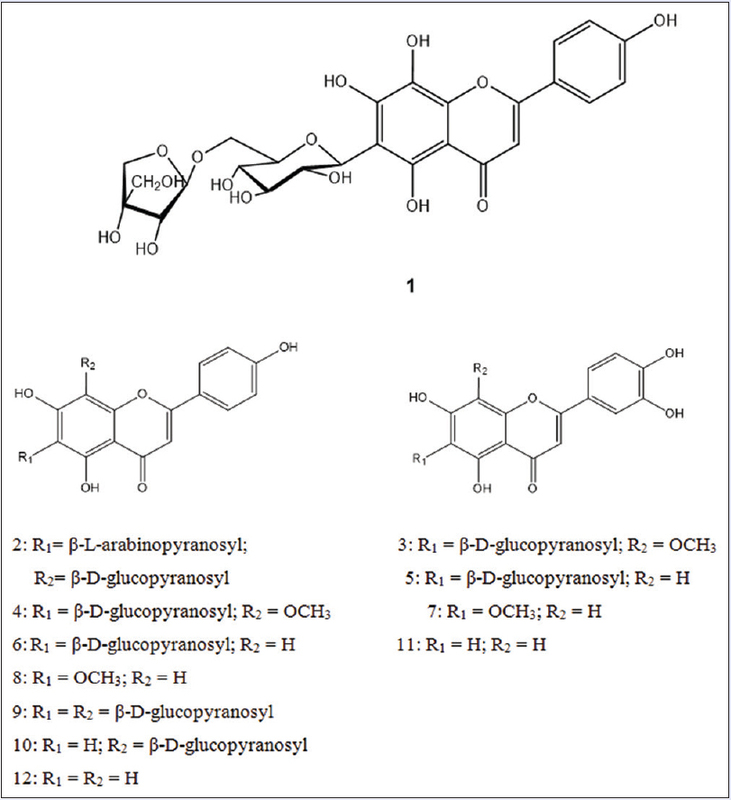 The structures of 1-12 [Figure 1] were fully elucidated on the basis of their UV, 1D and 2D NMR, ESI-MS data, and by comparison with previously published data.,, Compound 1 was expected to be an apigenin 6-C-diglycosyl derivative based on its chromatographic properties. UV spectrum in methanol exhibited two characteristic absorption bands at δmax≈ 340 (I) and ≈ 272 nm (II) for an apigenin nucleus. Free 7-OH was concluded from the bathochromic shift in band II, upon addition of NaOAc. In addition, the diagnostic batho- and hypso-chromic shifts observed upon addition of the other shift reagents, indicated the presence of free 5, 7 and 4'-OH groups.1H NMR and COSY spectra showed the resonances for B-ring protons of apigenin. This was explained from the presence of an A2X2 spin coupling system consisting of the two ortho doublets, each of 2 protons, at 8.13 and 6.92 for 2'/6' and 3'/5', respectively giving evidence to the 4'-hydroxyl B-ring, together with a singlet at δ 6.79 assigned to H-3. Absence of H-6 and H-8 signals gave an evidence for their substitution. The presence of two anomeric proton signals at δ 4.66 (d, J = 9 Hz, H-1'') and 5.19 (d, J = 1.2, H-1''') gave an evidence for one C-glucose and O-apiose moieties. The anomeric configurations of D-glucose and D- apiose were identified to be β-configurations, based on the magnitudes of the J1,2 coupling constants obtained from the 1H NMR spectrum. Moreover, depending on their δ- and J-values and splitting pattern of all 1H and 13 C-singals, the stereo-structures of glucose and apiose were identified as C-β-4 C1-pyranose and O-β-furanose, respectively. The downfield shift of H-6'' (3.88) of the glucose moiety affirmed the position of the inter-glycosidic linkage. The 13 C NMR spectrum showed the presence of thirteen carbon resonances, including an α/β-unsaturated ketone carbonyl signal at δ 182.27, characteristic for an apigenin nucleus. Downfield shift of C-6 at 108.81 (≈ +10 ppm) gave an evidence for its substitution by a C-glycosyl moiety, while the downfield shift of C-8 at about 128.58 (≈ +33 ppm) revealed it's hydroxylation., In addition, the intrinsic downfield shift of C-6'' of the glucose moietyat δ 69.25 (Δ ~ +9 ppm) in the 13 C NMR spectrum was a diagnostic evidence for the inter-glycosidic linkage as 1'''→6''. Assignment of the anomeric carbon of apiosyl moiety at 109.03 ppm was a key signal among other C-resonances for the O-β-D-furanose structure. Moreover, the HMBC spectrum showed a long range correlation between glucose H-1 and C-6 (108.81) of the apigenin aglycone, confirming the site of glycosidation [Figure 2]. Similarly, the inter-glycosidic linkage of the disaccharides were characterized by long range correlations observed between CH2-6 of glucose and C-1 (109.03) of O-apiose and the reverse cross peak of H-1 for O-apiose with C-6 (69.25) of glucose. Therefore, compound 1 was identified as 8-hydroxyapigenin 6-O-β-D-apiofuranosyl-(1''' → 6'')-C-β-D-glucopyranoside. Both AME extracts of Gaillardia species were nontoxic up to the maximum soluble dose (5 g/kg b.wt.). They exhibited a significant inhibition of edema only at 1000 mg/kg b.wt. by 17.85, 18.88, 18.30, 25.55% (G. grandiflora) and 17.69, 21.21, 20.95, 27.96% (G. pulchella) after 1, 2, 3 and 4 h post carrageenan injection, in comparison to control group [Table 1]. The two extracts exhibited a significant hepatoprotective effect in a dose-dependent manner [Table 2]. Paracetamol group showed significant elevation in ALT, AST and ALP levels by 64.03, 67.91 and 86.12%, respectively compared with control group. The AME of G. grandiflora exhibited a significant reduction in ALT (42.04, 41.53%) and AST (22.81, 30.99%) levels by 500 and 1000 mg/kg, respectively. Moreover, G. pulchella AME significantly decreased the ALT (25.33, 36.79 %) and AST (24.58, 36.71%) levels at 500 and 1000 mg/kg, respectively. The AME of G. grandiflora and G. pulchella significantly decreased ALP level by 15.92% and 14.12%, respectively only at a dose of 1000 mg/kg, as compared to the paracetamol group. Silymarin group exhibited a significant reduction in ALT, AST and ALP serum levels by 35.53, 37.79 and 41.37%, respectively as compared to paracetamol treated group. Both Gaillardia species are characterized by their sesquiterpenes derivatives,,,, but only few phenolic compounds were reported from genus Gaillardia., In this study, we evidence for the first time by chemical and spectroscopic data that AME of G. grandiflora and G. pulchella contain a large number of phenolic constituents, especially of the flavone type viz. eight glycosylflavones (1-6, 9-10) together with four flavone aglycones (7, 8, 11, 12). Many studies explored the anti-inflammatory activity of apigenin and luteolin, and their possible mechanism(s) of action. One study confirmed that the administration of the two flavones markedly inhibited acute carrageenan-induced paw edema in mice, while the flavonol fisetin failed to have an effect. A second study showed that the aqueous extract of Barleria cristata leaves exhibited significant anti-inflammatory activity due to the presence apigenin, quercetin, naringenin, and luteolin. A third study showed that flavonoid glycosides such as vitexin, regardless of chemical structures of the aglycones, did not significantly inhibit nitric oxide (NO) production. Generally, flavones showed stronger inhibition of NO production than flavonols, as apigenin, wogonin, and luteolin were the most active inhibitors among natural flavonoids tested. In addition, results strongly suggested that the presence of a double bond between C-2 and C-3 is critical for inhibiting NO production and that hydroxyl substitutions on A- and B-rings influence the inhibitory activity. The A-ring 5-/7- and B-ring 3-/4- hydroxylation(s) gave favorable results, while C-3 hydroxylation as in case of flavonol, did not. The results of another study suggested that apigenin has significant anti-inflammatory activity that comprises the blocking of NO mediated cyclooxygenase 2 expression and monocyte adherence. Previous studies performed for evaluation of the hepatoprotective activity of flavonoids, tested the activity of total flavonoids isolated from Laggera alata. The flavonoid samples were tested against carbon-tetrachloride (CCl4) induced injury in cultured neonatal rat hepatocytes and in rats having hepatic damage. Flavonoids showed improvement of cell viability and inhibited cellular leakage of hepatocyte AST and ALT induced by CCl4 at a concentration range of 1–100 μg/mL. In addition, an in vivo evaluation of the flavonoids activity at 50, 100 and 200 mg/kg oral doses significantly reduced the levels of albumin, ALT, AST and total protein in serum, as well as the hydroxyproline and sialic acid levels in liver. Moreover, histopathological inspection showed the improvement in damaged liver with the treatment of flavonoids. Furthermore, a study was performed for evaluation of the active constituents and hepatoprotective activity of the ethanol extract of Scoparia dulcis (SDE) at doses of 0.5 and 1 g/kg on acute liver injury induced by CCl4. Results showed that the SDE contained about 3.1 and 1.1 mg of luteolin and apigenin, respectively per g of the extract. In addition, results demonstrated that SDE could alleviate CCl4-induced acute liver injury in mice, as it caused a significant inhibition of the increase of serum ALT and AST, decreased the malondialdehyde level and elevated the amount of reduced glutathione in the liver, as compared with the CCl4 group. Furthermore, the SDE enhanced the activities of anti-oxidative enzymes, including glutathione peroxidase, glutathione reductase, glutathione-S-transferase and superoxide dismutase. Histological analyses also showed that SDE reduced the extent of liver lesions induced by CCl4, including neutrophil infiltration, vacuole formation and necrosis. The presence of flavone mixtures in the AME of both G. grandiflora and G. pulchella may enhance their anti-inflammatory and hepatoprotective activities. Regarding the safety of both AME extracts and their significant anti-inflammatory and hepatoprotective activities in results obtained in the current study, it is emboldening to subject both plants to further phytochemical and biological studies to confirm the possibility of their therapeutic use in different inflammatory diseases, which may be important for the development of new natural drugs. The current study sheds light for the first time on the phenolic constituents of G. grandiflora and G. pulchella aerial parts. In addition, the AME extracts of both species were found to be safe and exhibited significant anti-inflammatory and hepatoprotective activities. Both plant species may thus be promising candidates for natural anti-inflammatory and hepatoprotective drugs. Bailey LH. The Standard Cyclopedia of Horticulture. New York: The Macmillian Company; 1935. Osorio RA. Gardener's Guide to Florida's Native Plants. Gainesville: University Press of Florida; 2001. Harimaya K, Inayama S. Structure activity relationships of pseudoguaianolides isolated from Gaillardia pulchella and their derivatives. Heterocycles 1990;30:993-1008. Yu S, Fang N, Mabry TJ, Abboud KA, Simonsen SH. Sesquiterpene lactones from Gaillardia pulchella. Phytochemistry1988;27:2887-91. Dzhazin KA, Gatilov YV, Adekenov SM. 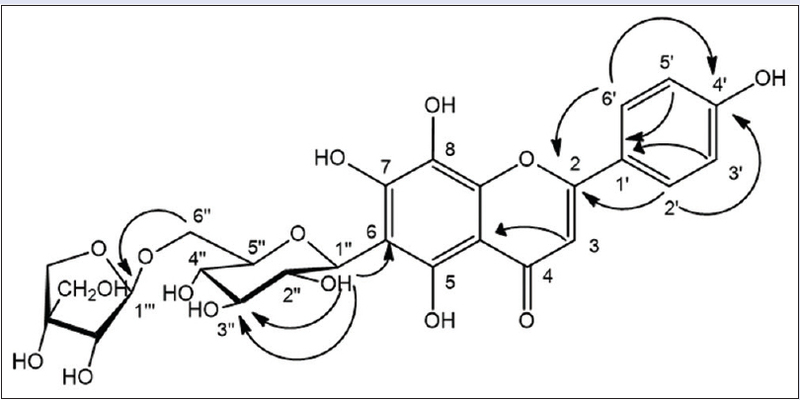 Gaigranin and gaigrandin as new sesquiterpene lactones from Gaillardia grandiflora. Him Prir Soedin 1995;1:79-85. Harimaya K, Arai N, Inayama S. A new helenanolide, 11βH-Dihydro-4-epineopulchellin, isolated from Gaillardia grandiflora. Chem Pharm Bull1989;37:2525-7. Herz W, Pethel KD, Raulias D. Isoflavones, a sesquiterpene lactone-monoterpene adduct and other constituents of Gaillardia species. Phytochemistry 1991;30:1273-9. Zielinska M, Gill S. Flavonoid compounds of Gaillardia aristata Pursh. Rocz Chem 1974;48:1111-2. Inayama S, Harimaya K, Hori H, Ohkura T, Kawamata T, Hikichi M, et al. Studies on non-sesquiterpenoid constituents of Gaillardia pulchella. II. Less lipophilic substances, methyl caffeate as an antitumor catecholic. Chem Pharm Bull (Tokyo) 1984;32:1135-41. Kupchan SM, Cassady JM, Kelsey JE, Schnoes HK, Smith DH, Burlingame AL. Structural elucidation and high-resolution mass spectrometry of gaillardin, a new cytotoxic sesquiterpene lacone. J Am Chem Soc 1966;88:5292-302. Moharram FA, Marzouk MS, El-Shenawy SM, Gaara AH, El Kady WM. Polyphenolic profile and biological activity of Salvia splendens leaves. J Pharm Pharmacol 2012;64:1678-87. Semler DE. The rat toxicology. In: Gad SC, Chengelis CP, editor. Animal Models in Toxicology. New York, Basel, Hong Kong: Marcel Dekker Inc.; 1992. p. 39. Silva VM, Thibodeau MS, Chen C, Manautou JE. Transport deficient (TR-) hyperbilirubinemic rats are resistant to acetaminophen hepatotoxicity. Biochem Pharmacol 2005;70:1832-9. Bergmeyer HU, Hørder M, Rej R. International Federation of Clinical Chemistry (IFCC) Scientific Committee, Analytical Section: Approved recommendation (1985) on IFCC methods for the measurement of catalytic concentration of enzymes. Part 3. IFCC method for alanine aminotransferase (L-alanine: 2-oxoglutarate aminotransferase, EC 2.6.1.2). J Clin Chem Clin Biochem 1986;24:481-95. Klauke R, Schmidt E, Lorentz K. Recommendations for carrying out standard ECCLS procedures (1988) for the catalytic concentrations of creatine kinase, aspartate aminotransferase, alanine aminotransferase and gamma-glutamyltransferase at 37 degrees C. Standardization Committee of the German Society for Clinical Chemistry, Enzyme Working Group of the German Society for Clinical Chemistry. Eur J Clin Chem Clin Biochem 1993;31:901-9. Tietz NW, Shuey DF. Reference intervals for alkaline phosphatase activity determined by the IFCC and AACC reference methods. Clin Chem 1986;32:1593-4. Mabry TJ, Markham KR, Thomas MB. The ultraviolet spectra of flavones and flavonols. In: The Systematic Identification of Flavonoids. New York: Springer Verlag; 1970. p. 41-164. Harborne JB. Flavone and flavone glycosides. In: Williams CA, Harborne JB, editors. The Flavonoids Advances in Research Since 1986. New York: Chapman & Hall; 1994. p. 337-85. Agrawal PK, Bansal MC. Flavonoid glycosides. In: Agrawal PK, Bansal MC, editors. Studies in Organic Chemistry 39, Carbon-13 NMR of Flavonoids. Amsterdam, The Netherlands: Elsevier; 1989. p. 283-364. Bratkov VM, Shkondrov AM, Zdraveva PK, Krasteva IN. Flavonoids from the genus Astragalus : Phytochemistry and biological activity. Pharmacogn Rev 2016;10:11-32. Yadav P, Malpathak N. Estimation of antioxidant activity and total phenol, flavonoid content among natural populations of caper (Capparis moonii, Wight) from Western Ghats region. Indian J Pharm Educ Res 2016;50:495-501. Oliveira FG, de Lima-Saraiva SR, Oliveira AP, Rabêlo SV, Rolim LA, Almeida JR. Influence of the extractive method on the recovery of phenolic compounds in different parts of Hymenaea martiana Hayne. Pharmacognosy Res 2016;8:270-275. El-gizawy H A, Hussein MA. Isolation, structure elucidation of ferulic and coumaric acids from fortunella japonica swingle leaves and their structure antioxidant activity relationship. Free Radic Antioxid 2017;7:23-30. Venkatesan A, Kathirvel A, Prakash S, Sujatha V. Antioxidant, antibacterial activities and identification of bioactive compounds from terminalia chebula bark extracts. Free Radic Antioxid 2017;7:43-9. Dutta S, Das S. A study of the anti-inflammatory effect of the leaves of Psidium guajava Linn. on experimental animal models. Pharmacognosy Res 2010;2:313-7. Middleton E Jr., Kandaswami C, Theoharides TC. The effects of plant flavonoids on mammalian cells: Implications for inflammation, heart disease, and cancer. Pharmacol Rev 2000;52:673-751. Havsteen BH. The biochemistry and medical significance of the flavonoids. Pharmacol Ther 2002;96:67-202. Pan MH, Lai CS, Ho CT. Anti-inflammatory activity of natural dietary flavonoids. Food Funct 2010;1:15-31. Manthey JA, Grohmann K, Guthrie N. Biological properties of citrus flavonoids pertaining to cancer and inflammation. Curr Med Chem 2001;8:135-53. Middleton E Jr., Kandaswami C. Effects of flavonoids on immune and inflammatory cell functions. Biochem Pharmacol 1992;43:1167-79. Nishizuka Y. The molecular heterogeneity of protein kinase C and its implications for cellular regulation. Nature 1988;334:661-5. Ferrándiz ML, Alcaraz MJ. Anti-inflammatory activity and inhibition of arachidonic acid metabolism by flavonoids. Agents Actions 1991;32:283-8. Ferrándiz ML, Nair AG, Alcaraz MJ. Inhibition of sheep platelet arachidonate metabolism by flavonoids from Spanish and Indian medicinal herbs. Pharmazie 1990;45:206-8. Laughton MJ, Evans PJ, Moroney MA, Hoult JR, Halliwell B. Inhibition of mammalian 5-lipoxygenase and cyclo-oxygenase by flavonoids and phenolic dietary additives. Relationship to antioxidant activity and to iron ion-reducing ability. Biochem Pharmacol 1991;42:1673-81. Yoshimoto T, Furukawa M, Yamamoto S, Horie T, Watanabe-Kohno S. Flavonoids: Potent inhibitors of arachidonate 5-lipoxygenase. Biochem Biophys Res Commun 1983;116:612-8. Damas J, Bourdon V, Remacle-Volon G, Lecomte J. Pro-inflammatory flavonoids which are inhibitors of prostaglandin biosynthesis. Prostaglandins Leukot Med 1985;19:11-24. Moroney MA, Alcaraz MJ, Forder RA, Carey F, Hoult JR. Selectivity of neutrophil 5-lipoxygenase and cyclo-oxygenase inhibition by an anti-inflammatory flavonoid glycoside and related aglycone flavonoids. J Pharm Pharmacol 1988;40:787-92. Hoult JR, Moroney MA, Payá M. Actions of flavonoids and coumarins on lipoxygenase and cyclooxygenase. Methods Enzymol 1994;234:443-54. Tordera M, Ferrándiz ML, Alcaraz MJ. Influence of anti-inflammatory flavonoids on degranulation and arachidonic acid release in rat neutrophils. Z Naturforsch C 1994;49:235-40. Gambhire MN, Wankhede SS, Juvekar AR. Antiinflammatory activity of aqueous extract of Barleria cristata leaves. J Young Pharm 2009;1:220-4. Lee JH, Zhou HY, Cho SY, Kim YS, Lee YS, Jeong CS. Anti-inflammatory mechanisms of apigenin: Inhibition of cyclooxygenase-2 expression, adhesion of monocytes to human umbilical vein endothelial cells, and expression of cellular adhesion molecules. Arch Pharm Res 2007;30:1318-27. Wu Y, Wang F, Zheng Q, Lu L, Yao H, Zhou C, et al. Hepatoprotective effect of total flavonoids from Laggera alata against carbon tetrachloride-induced injury in primary cultured neonatal rat hepatocytes and in rats with hepatic damage. J Biomed Sci 2006;13:569-78.